Most of the time Tammy and I record TV shows, which means we usually fast forward through commercials. But there was recently a Kohl’s commercial that caught my eye and not because a mother and daughter were singing “What a Feeling” while dancing through the store. Do you like it? You do? Awww, me too. Instead it was because of the haircut of the lady behind the counter. I couldn’t believe that someone told this lady that this hair style looked good on her, but what was even more shocking was that someone cast her and put her on air with this haircut. Because I’ve heard Tammy talk so much about how she doesn’t ever want to have short hair, I decided to get her thoughts on her having that haircut. Me: What would you do if you woke up with that hair? Tammy: I don’t know, Jason. What would you do? Me: I’d say, “I didn’t do it.” Oh man, you’d cry so hard. Tammy: Yeah, I don’t think I could go to work. Me: You’d be crying all day. Tammy: I think I’d drive to Illinois to have my sister put some extensions in. I’d tell her I have a REAL hair emergency. I’m having a REAL hair emergency. Tammy: What if someone told me they would give me $1 million to cut my hair like that and couldn’t do anything with it for a year. I had to let it grow out. Me: I’d be OK with that. Tammy: What?!?! (staring me down) You’d have to look at me with that hair. Me: So, you’d still have your face. Tammy: Yeah, but I’D have to look at myself and I don’t think I could do that. (pause) I’d never get any “looks” again, at least not any good ones. Gallery | This entry was posted in Daily Life and tagged beauty, daily life, Hair, hair & makeup, Hair Care, Hairstyle, health, humor, people, Postaweek2013, relationships, shopping, style, Tammy. Bookmark the permalink. Uh gee, maybe it’s her dance moves? That’s why they hired her. Although, I admit I would allow my hair to be cut that way for a million bucks! So long as I could wear a hat or a wig, I’m good. I’d do a LOT of things for a million bucks and growing my hair would be the least of my concerns. Look at all the hair styles I’ve worn over the years…. FOR FREE. I hate that stupid haircut. Anyone who would intentionally have that done to her hair (barring the one million dollar dare you mentioned) is a certifiable idiot. Unless there was a great deal of money involved, I would not associate with a person like that. Granted that I am far from being an attractive person myself, but this woman has intentionally cast aside what seem to be otherwise attractive features in the quest to have a ” hip” hairstyle. If Kohl’s cast her to get people talking, mission accomplished. 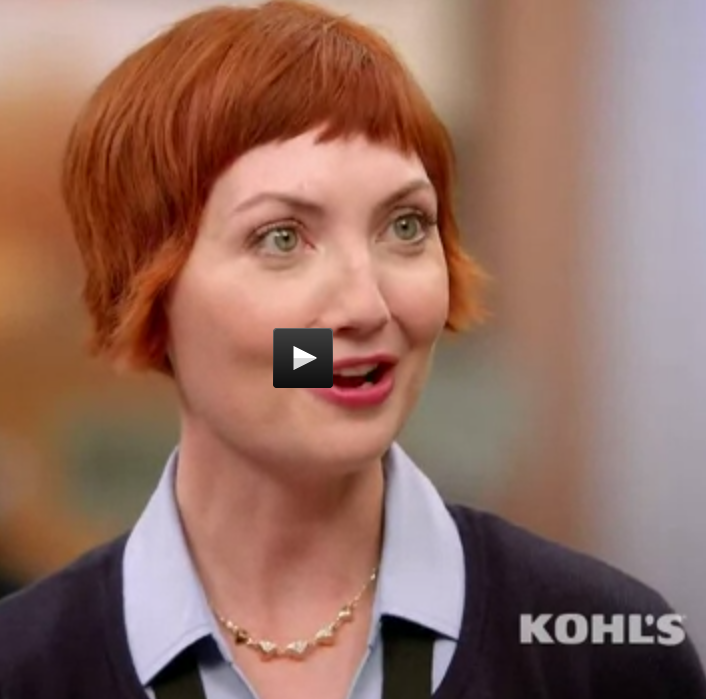 If Kohl’s wanted positive brand recognition with this commercial, total fail. All I remember is her hair and people singing. Neither of which made me want excited about going into Kohl’s. I have to think there were SEVERAL Certifiable Idiots involved in this decision. I think she cut her hair with the Flowbee. Giggle, snort!